3PP is delighted to welcome Noah Charney, art historian, author, and president of the Association for Research into Crimes against Art or ARCA. His 2010 non-fiction title, Stealing the Mystic Lamb: The True Story of The World's Most Coveted Masterpiece explores the tumultuous history of the Ghent Altarpiece, an art historical wonder created by brothers Hubert and Jan van Eyck in the early 15th Century. Narrowly escaping destruction during the post-Reformation Iconoclasm that swept Europe - it became the prize of both Napoleon and Hitler in a staggering series of thefts. The Altarpiece now resides in its original home, the Saint Bavo Cathedral in Ghent, Belgium. Noah is now a staff blogger with the prominent art news site, ArtInfo - his blog The Secret History of Art is thoroughly recommended to anyone that enjoys the historical and iconographical puzzles in art history. 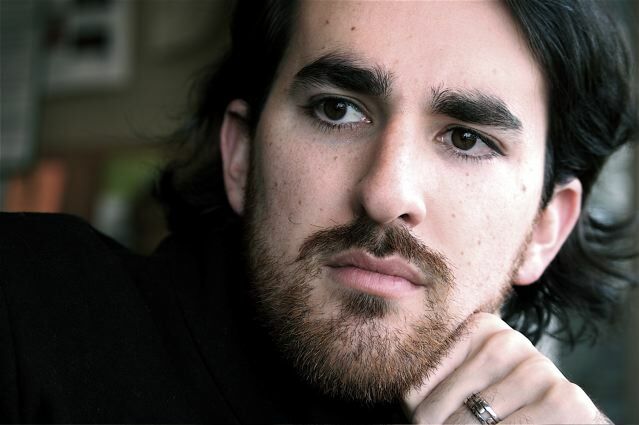 With an academic background that includes the Courtauld Institute and Cambridge, Noah is one of the new generation of highly accomplished art historians, with an acute awareness of the need for art history to interface with scientific advancements, and to reach for a global audience via the web. In addition to exploring the fascinating world of art crime and the brothers van Eyck, I took this rare opportunity to quiz Noah about the future of art history online and the controversial topic of connoisseurship. 3PP: What inspired you to recount the amazing tale of the Ghent Altarpiece? NC: Back as an undergraduate at Colby College in Maine I had three amazing art history professors, Michael Marlais, Veronique Plesch, and David Simon. They were friends as well as teachers, and it’s really thanks to them that I became an art historian. One day in a class on Hellenistic Art, David Simon made a brief side-comment about the Ghent Altarpiece. He said that it was the most frequently stolen artwork in history, and a candidate for the single most desired object in history. I could easily confirm the first statement, but the second intrigued me. The more I thought of it, the more I reasoned that it could be true, as long as we’re talking about verifiable, extant objects (as opposed to, say, the holy grail or the fountain of youth). I always intended to write both fiction and non-fiction, so I recalled the story of the Ghent Altarpiece after my first novel came out, and thought it would make a good, dynamic choice for a work of history. 3PP: Van Eyck pieces have a dazzling physical presence - can you recall the first time you first saw a van Eyck in person? NC: I first saw them in person on a visit to Belgium as a post-graduate at Cambridge. Just about my favorite thing in the world is visiting art in churches—that probably sounds weird, but there you go. I love the theater of a church, the sense of artistic pilgrimage to see a great work in person, the drama of anticipation and the approach to finally seeing a masterpiece that you’ve studied in advance and can only imagine. This is why living in Italy is ideal for me—there are over 90,000 churches (600 in the center of Rome alone), so it keeps me busy. What is immediately striking about the painting is its size, coupled with the incredibly intricate detail. The two seem like they should be incongruous, but they work beautifully here. 3PP: The Northern Renaissance has always seemed to reside in the mists of time, behind the more publicised Southern(Italian) Renaissance artists. Was this due to the fact that Italians were better at self promotion, and had a biographer like Vasari who elevated them to superstar status? NC: There are a few reasons for this, but the main one is that the English “discovered” Florence, and to a secondary extent Rome, in the 19th century (think of “A Room with a View”), and had “discovered“ Venice in the 18th century, so for reasons of climate Italy became a focal point. Of course Vasari had a hand in it, but the north had its own version of Vasari, Karel van Mander. But Renaissance Florence really opened up to British eyes (don’t forget the Pre-Raphaelites, too), because it was the ideal Grand Tour destination—whereas Ghent and such had less of an exoticism and climate appeal. Of course the greatest of all self-promoting artists was a northerner, Albrecht Dürer, but it’s better to have an independent publicist, and Vasari was just that. But he had an agenda—he thought his own, Tuscan art was the best possible style, and Michelangelo the best artist that could ever be. He may have a point, but he was dismissive of anything that competed with his thesis. Therefore those who studied art history were more likely to follow Vasari’s prejudiced view. 3PP: What do you make of the enigma that is Hubert van Eyck? Some galleries have now attributed works to him without a large deal of supportive evidence. How did he remain obscured from history for so long? NC: I love the mystery of it. Art history has a good measure of mysticism about it, and while scientific elements are important, it is far from a science. So much depends on discovering documents or the opinion of experts, two things on which it is difficult to rely. In short, there certainly was a Hubert van Eyck working in Ghent in the 1410s and early 1420s. A number of archival documents from the time attest to this. He was probably, but not certainly, Jan’s elder brother. But not a single universally-agreed-upon work is attributed to him. Museums are full of unattributed works, and we must assume that a small number of these are by Hubert. But the shock to the art world when the hidden inscription on the back of The Ghent Altarpiece implied that Hubert was the greater artist and that Jan had simply finished the altarpiece when Hubert died cannot be overstated. My conclusion is that Hubert was commissioned to paint the altarpiece, but died too early in the process to have painted any of the finished product that we see today—Jan got special permission from Duke Philip the Good to fulfill the commission after his brother’s death. 3PP: Your work with ARCA and publications about Art Crime are well known. What drew you to this side of art historical inquiry? 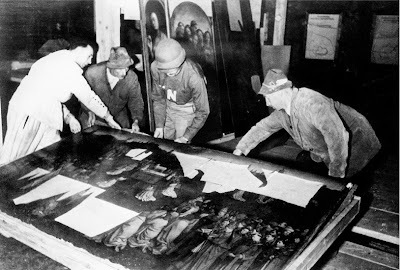 NC: I was on a path of post-graduate study in the more “normal” art historical vein (my field was iconography in 16th century Florentine painting) when I wrote my first novel, The Art Thief, just for fun. I had written lots of plays and wanted to try my hand at a novel. I was used to scholarly research, so I set about researching art crime as I would a Masters thesis. And I found shockingly little scholarship published on art crime. I decided to shift the focus of my studies to art crime largely because it was an open field. I knew that any work I could produce would have an impact, and that was appealing. I also like the fact that everyone, from fellow professors to cab drivers, finds art crime intriguing—whereas only five peers and my mother would read my art history books if they were of the rather dry, academic variety. I’ve always been more interested in addressing the widest possible readership rather than an audience of a handful of peer academics, so while I write academic work occasionally, my real love is translating the academic material into something approachable and enjoyable, to encourage the lay reader to turn to the wonders of art history. 3PP: Can you describe your role at ARCA? What has been your most rewarding recovery of stolen art? NC: I founded ARCA in 2007 and now I’m its president, but it’s run by a pair of very capable directors. ARCA, the Association for Research into Crimes against Art, is an international non-profit research group, studying art crime and cultural heritage protection. We run the world’s first interdisciplinary academic program in the study of art crime, a Masters held each year in Umbria, and we published a peer-reviewed academic journal, The Journal of Art Crime, among our many activities. We don’t actually investigate (a popular misconception)—that’s best left to the police, but we work with police on how lessons from the history of art crime can inform current investigations and art security. Our role is in education and research, working hand in hand with police, security directors, museums, lawyers, insurers, archaeologists, and so on, to inform the public and hopefully curb art crime. 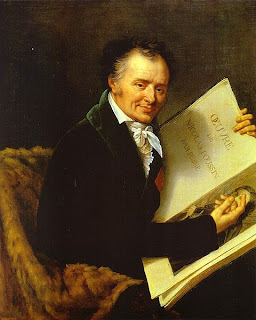 3PP: It was fascinating to read about Dominique Vivant Denon - artist and advisor to Napoleon who helped shape the Louvre Museum into what is essentially the greatest collection of plundered art in the world. I enjoyed reading how he was the pioneer of modern gallery displays with thematically congruous isolated works, as opposed to the ceiling high stacked presentation you still see at certain palaces. Is Denon a hero or a villain in the annals of art history? NC: Denon is both a hero and a villain, and the more interesting for it. Museums as we know them today would not exist but for his innovations (he was the first, for instance, to hang art at measured distances on the wall, rather than stacking the paintings all over the wall, and also to dramatically place a major artwork so that it is framed by doorways as you look through the galleries). He was living in a different time, difficult for us to grasp—as far as he knew, Napoleon was going to take over the world permanently, and so it did not seem so untoward that the art of each defeated adversary should be shipped off to Paris for display. The fact that much remains in the Louvre and has never been returned is another issue. 3PP: In describing standards of evidence for the attribution of paintings, you liken aspects of traditional connoisseurship to a parlour trick or 'super sensory' divination. Is there a tension between traditional appraisal and the advent of scientific methods to enhance attribution methodologies? NC: It always strikes me as odd and a bit silly that academics get so upset about connoisseurship these days. A professor recently taught a course on it at Yale and was booed by other professors soundly, because connoisseurship is out of fashion. One of the last places that still teaches it is my alma mater, The Courtauld Institute. In the past, the individual word of an expert (the connoisseur) was the best way of proving the authenticity of a work. Bernard Berenson was the most famous of these experts. But we now know that 1) connoisseurs could often be mistaken, and 2) connoisseurs often made intentional misattributions when there was a profit to be had. These days provenance is the safest way to prove authenticity and to prove that a work of art is legally owned. Scientific examination is another method, but one which is still met with suspicion in some circles. Of course the best of all is a combination of connoisseurship, provenance, and science, but academics can be rather territorial and opinionated, wielding their footnotes like knives, so it remains a bit touchy. 3PP: Your transition from independent to professional blogger at ArtInfo was lightning quick! Was this planned? NC: This was a surprise. I wanted to do something that would force me to write daily, and my publicist recommended a blog as a way to interact more with readers. I began a blog and accompanying podcast, both called “The Secret History of Art,” just a few months ago, before Christmas. Just after Christmas ArtInfo asked if I would be up for moving it to their site and becoming a regular columnist. It’s worked out very well, and I’ve received numerous emails from readers who are enjoying it, so I’m pleased to continue. 3PP: Art history online is developing a strong presence, particularly since 2009, which saw a sharp rise in blogs and other online resources. As one of the growing number of professionals writing about art history online, what is your vision for the future of art history in the digital age? NC: I’ll tell you my dream, which the Google Art Project has begun. In an ideal world, every art object, both on display and in storage, in every museum in the world, would be digitized and a high-quality, zoomable image would be available online. Of course that sounds utopian, but Google Art Project has begun with a few works from a few museums. There are many works which you simply cannot find online, and often which are nearly impossible to find in books, too. Access to images that are sufficiently clear and detailed to be able to examine them up close by zooming digitally would make a world of difference. I also just love art, and think anything that can introduce artworks to people who might not otherwise consider them is a good thing. That is why I’m happy to be a less-academic academic—I think fiction, television, trade non-fiction, and blogs are the best way to open the art world to those who have not yet embraced it. Writing a catalogue raisonné is important for the field of art history, but it’s also got a limited audience and is preaching to the converted. I’d rather write a book that 10,000 people who might otherwise never have gone to the Prado would read and make a bee-line to see its treasures. Or, in this case, head of to Ghent for caramel waffles, beer, and the Ghent Altarpiece. Wonderful interview, I truly look forward to the book. Thanks for sharing! Cheers @thiswritelife! You will love the book - what is great is the variety of formats available. You can also get an electronic and audio version. I really enjoyed the audio version as well - the reader chosen had a voice that suited the content - sounding not unlike a 1940s newsreel narrator - which perfectly suited the sections on the World War II sections and the work of the Monuments Men. I'm in the middle of "Stealing the Mystic Lamb" and want to echo H's praise for this book. It's a very interesting and compelling read.